Bikini season has arrived — but is your bag stuffed with the right summer goodies? You've dusted off your bikini, dug out your favorite chic beach bag — but now it's time to stock up on this summer's hottest essentials. Star is here to help by rounding up all these must-have products for you! Keep clicking through to see what is at the top of our list this year. 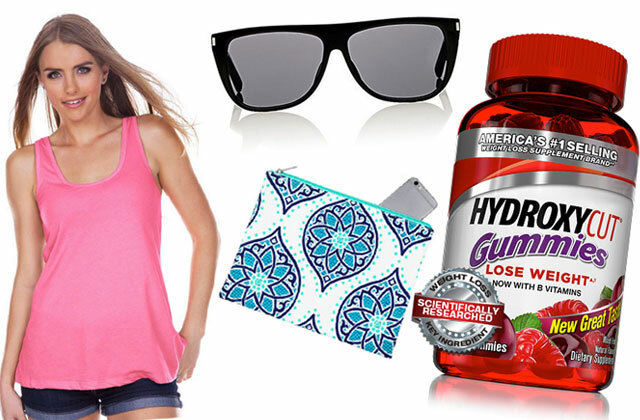 Staying hydrated while soaking up rays is important, but who says it has to be boring? Make the necessity way more fun with this mermaid-themed water bottle. Get your Beats headphones ready for summer by giving them a facelift! This vintage summer colored chevron V4 skin is the perfect way to do it. Looking for a beach read that really lives in the moment? Jill Eisenstadt's new novel centers around a group of high school students who split for the summer following graduation — but what drama will unfold when they reunite for one last kegger together? Have plans later in the day after you hit the beach? This monogram zip pouch boho bag is the perfect way to stash your wet suit before getting to your next party! Summer is all about boasting bright colors, and what better way to welcome the season with this flirty pink tank? Kim Kardashian rarely goes out without her trendy shades — so grab a lookalike pair to show your pals you are the most fashion-forward of them all! Your beach towel is just as much as a statement as your bikini style, so don't fall flat with a plain-jane one! This royal purple chic-feathered beach towel will help you grab stares as you set up your tanning station. While getting your extra dose of Vitamin D on the beach this summer, why not have Hydroxycut Gummies on hand to help you work towards your goals. These great tasting fruit bursting gummies also contain B vitamins to help metabolize fats, proteins and carbs. Get your glow from the sun and keep your goals in site.